Let's get ready to thunder! The God of Thunder is ready to cut loose in Thor: Ragnarok and this statue captures the Odinson at his most heroic in this Marvel Gallery PVC statue! 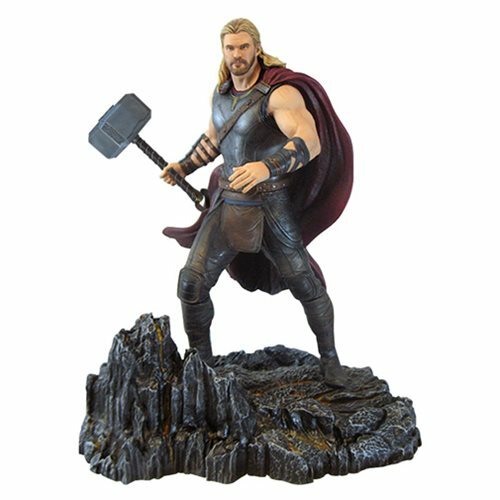 Standing atop a rocky outcropping, this battle-ready Thor wields Mjolnir, ready to face the hordes of Hela herself. Standing approximately 10-inches tall, this plastic statue features detailed sculpting and paint applications. Packaged in a full-color window box. Sculpted by Rocco Tartamella. Ages 14 and up.